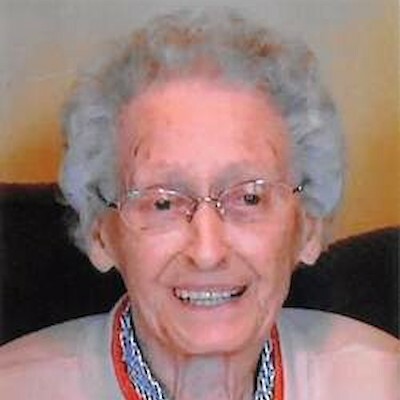 Delores Peterson, 94 of Turtle Lake, WI, died Thursday, March 21st, 2019 at Golden Age Manor in Amery, WI. She was born on September 18, 1924, in Cumberland, WI to Fred and Rosa (Kleinert) Riebe. She attended Lakeland Country School grades 1 through 8 and graduated from Cumberland High School in 1942. As a teen she worked at Vinsch's Resort on Granite Lake and after graduation began work at the Company Store in Cumberland. She was married to Herman (Bud) Peterson on March 8, 1944, in Camp Howze, TX where he was training to serve for combat in Europe during WWII. Bud and Delores moved a few more times before moving to Turtle Lake where they resided for 62 years and raised 4 children. Delores was an employee at 3M in Cumberland for 25 years retiring in 1985. In 2014 she became a resident at Golden Age Manor in Amery, where she received wonderful care and made many dear friends. She is survived by 2 sons: Bob Peterson of Menomonie, WI and Tom (Charlene) Peterson of Somerset, WI; 2 daughters: Mary (Jim) Ligday of Stillwater, MN and Cindy Moe of Amery, WI; 9 grandchildren: Tom (Amy) Peterson of Hammond, WI, Stacie (Darek) Mason of New Richmond, WI, Brian Towey of Chaska, MN, Erin Taves of Ely, MN, Jon (Mical) Peterson of Richfield, MN, David (Hannah) Peterson of Minneapolis, MN, Ana (Tom) Hoban of Chicago, IL, Jenny (Brian) Toll of Star Prairie, WI and Andy Moe of Mendota Heights, MN; 3 step grandchildren: Jim (Julie) Ligday, Jason (Jennifer) Ligday and Josh Ligday; 10 great grandchildren: Jake, Hope, Olivia, Norah, Oscar, Elena, Mya, Nelle, Willow Dee and Maria; 8 step great grandchildren: Cameron, Kaleb, Kaleigh, Lexie, Kylie, Oliver, Miles and Lucy; and one sister-in-law, Lucille Riebe of Cumberland, WI. Delores was preceded in death by her husband Bud in 2002; 3 brothers: Alex, Roy, Harry; 4 sisters: Vinnie, Nora, Violet, Dorothy; and daughter-in-law Mary Beth Peterson. Funeral services will be held on Saturday, March 30, 2019, at the Parkview Methodist Church in Turtle Lake where Delores was a member. Services will begin at 11:00 AM with a visitation one hour prior to the service with Pastor Gil White officiating. In lieu of flowers, memorials may be directed to Golden Age Manor of Amery, WI.